Valid Evidence – the Japanese Balearic outfit formed by DJ 19 & YU-TA is back for their 4th installment of their remix collection series called ‘Journey’. It has been seventeen months since their last ‘Season’ release. ‘Haze Shade Of Love’ has been remixed by new Swedish house act, Rusty Dust. Formed late 2012, 19BOX fans are likely to be familiar with one half of the project, Hovelmann. As a result of this mutual appreciation for each other, they have started to produce tracks that have electro and trance elements. One the other hand, multi-talented jack-of-all-trades Sota S. has injected with his hard NRG stylings on ‘Angel Dust’. 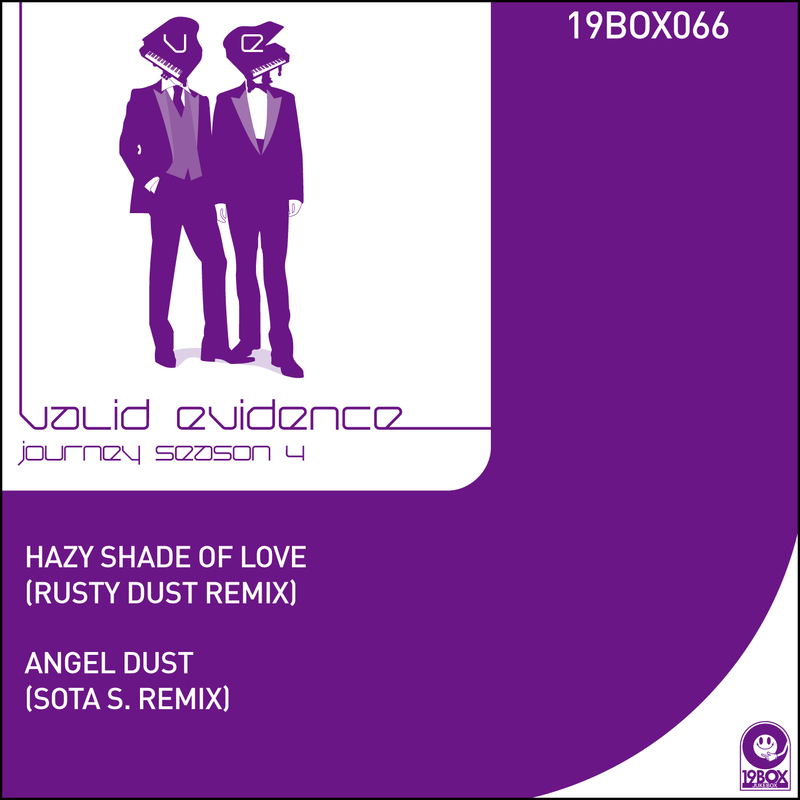 VALID EVIDENCE RUSTY DUST SOTA S.
Valid Evidence – the Japanese Balearic outfit formed by DJ 19 & Yu-Ta is back for their 4th installment of their remix collection series called ‘Journey’. It has been seventeen months since their last ‘Journey Season 3’ release. The good news is that this means they’ve been hard at work in the studio for their forthcoming second album. The new album will comprise of both original tracks and remixes of previous tracks. ‘Haze Shade Of Love’ has been remixed by new Swedish house act, Rusty Dust. Formed late 2012, 19BOX fans are likely to be familiar with one half of the project, Hovelmann. After a sending a message to Joakim on SoundCloud, they both agreed each producer fit the description to form a collaboration that would deliver a new sound into the house scene. As a result of this mutual appreciation for each other, they have started to produce tracks that have electro and trance elements. One the other hand, multi-talented jack-of-all-trades Sota S. has injected with his hard NRG stylings on ‘Angel Dust’. The original track was originally a chilled-out house track. Sota S. is most well-known as the organizer and promoter of TORTURE GARDEN JAPAN - which is one of the world’s most famous international fetish parties.